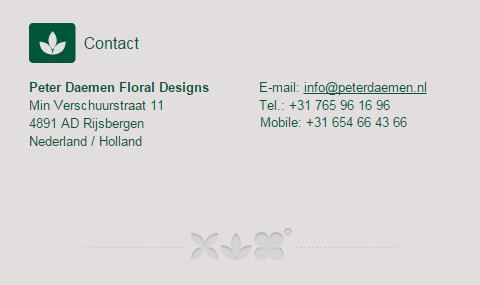 Peter Daemen is a floral designer/ landscaper from the Netherlands (Holland) with a very multidisciplinary approach to the divers branches of floral art and landscaping. He studied Garden Architecture and Floral art. With his know-how and high level of training, he works all over the world, and has become a very appreciated man. Together with his very great worldwide experience and professional view, he is able to create objects and projects which fit the customer perfectly. Because of all this he makes different designs than others do. His affinity with floral/ (spatial)designs, style, trends and the ability to work with people from a vast array of cultures, are the basics for his services, which are very high. His enthusiasm and love for nature is always reflecting his creations.